URBANA, Illinois -- In football, linebackers are usually the largest players and have the endurance required to get through a game plus overtime. But when it comes to fish, larger doesn't always mean stronger. A University of Illinois study showed smaller fish recover from exertion faster than larger fish. "The point of the study was to replicate an angling situation where anglers catch and release fish," said researcher Cory Suski. "We wanted to know if large fish and small fish had similar physiological responses to being exercised and released, particularly regarding the time it takes the fish to recover from exercise. "What we found is that the large fish take longer to recover from exercise than the small fish do. None of the fish really experienced any major hardships, and they all survived easily, but the small fish recovered faster than the big fish." Suski said the findings will be important for fisheries conservation. "Big fish are reproductively valuable as they tend to have more babies than small fish," he said. " Big fish are also rarer than small fish, and they are more often targeted by anglers. 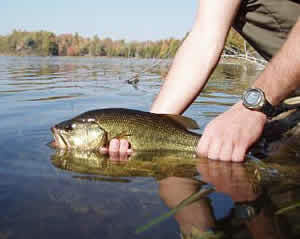 If anglers are planning to release a large fish after catching it, the results from this study emphasize the importance of angling the fish for a short duration, handling the fish gently, and getting it back into the water quickly so that excessive disturbances are minimized and the fish can recover quickly, begin feeding, and get back to normal." The fish in the study were largemouth bass. They were caught in nets, put into dark tanks and allowed to rest. Later they were chased for 60 seconds to simulate angling and the amount of energy they might expend during a catch-and-release episode. They were allowed to recover for 0, 1, 2, or 4 hours before being sampled for plasma and white muscle. Large largemouth bass exhibited elevated concentrations of plasma glucose and sodium relative to small fish following the exercise challenge. Large fish required additional time to clear metabolic disturbances in plasma and failed to restore potassium to basal levels even following 4 hours of recovery, indicating an improved ability of the smaller fish to recover from disturbances. "Before we began the research, we predicted that the larger fish would respond and recover from exercise more quickly, providing another size-based advantage for larger fish, but we found the opposite to be true," Suski said. Suski said anglers have always known that big fish are special, and the results of this study emphasize the need to treat big fish gently so they can be caught again in the future. The effect of body size on post-exercise physiology in largemouth bass was published in Fish Physiology and Biochemistry. Andrew J. Gingerich co-authored the paper.